The light of day brought a MUCH better Annabelle. Over night was a little scary with some yucky sounds, yucky blood gasses, and a parade of doctors through the room off and on. But this morning, our favorite day nurse and our favorite RT were able to suction out a bunch of gunk, and Annabelle is feeling SO much better, and her blood gasses are trending better too! AND… we have a GOOD plan for today to get rid of a lot of things!! YEAH for that! Today, we got rid of her ART line, so she has NO lines in her hands right now. And depending on the chest tube output today, we might get rid of those too, which should make Annabelle feel MUCH better. And we have her sitting up in a tumble chair, and WOW she likes it. She’s breathing much easier, her liver is smaller and softer, and things are just looking MUCH better right now. Mommy feels much better now too! Still haven’t weaned a lot on her vapotherm though due to last night’s issues. Hoping to get her O2 level down then we can start weaning more on her rate. Talked to one of the ladies on the transplant team more about “going home.” It’s SO SO SO nice to get to talk about that!! I haven’t let myself even go there for so VERY long. Am a little sad though that they said we can’t take her “out” anywhere for 3 months post transplant, which means church too! Blah! But… she’ll be home, and we can take her for stroller rides around the neighborhood on nice days. OHhhhh, that sounds SO SO SO nice right now!! Here are a few pictures from this morning with PT and while she was in her chair watching Veggie-tales, her FAVORITE! We played, “Where is God when I’m scared” which I think is really appropriate! I can see the worry in her eyes sometimes, like she just really doesn’t understand why things are different and why she hurts and feels so loopy. I don’t want her to be scared!!! I’m praying Jesus calms her and holds her in His arms even when I’m not able to do so as much as I’d like. Oh good, good, GOOD!! PRAYERS ANSWERS THIS MORNING!!!!!!!! Yay! I am so happy to hear that she is doing better! Yay! So Happy to hear that Annabelle is doing much better. Also happy to hear that "Home" is now much closer, it's so much of a relief to get out of that hospital environment and I"m sure other moms would say the same thing. Will definitely keep praying that she hangs in there, and also praying for you and Scott to get some rest sometime soon. What wonderful news. I'm so impressed by the awesome team of medical professionals who have done such a great job caring for your precious princess. Oh yes!! Thank you, Lord! That's great news all around. And I'm sure she will do even better when she is finally home! Praying that will happen real soon! Wonderful news!! I will continue to pray that the tend keeps moving up!! And a special thank you to you for keeping us updated! How gracious of you in this very hectic time!! Yay!!! So glad to hear the news is good today. May she be home VERY soon! What amazing news! Thank you, and praise God for all His Annabelle miracles this week. She is beautiful! Praising God for what he has done and going to do! I'm so glad she is doing better. I can tell by the tone of your post that you're better than this morning when I talked to you. By the way, Annabelle is such a pretty baby! 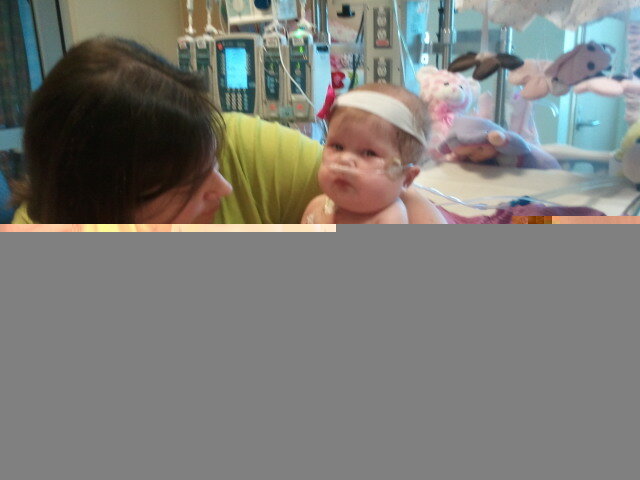 I have been praying for Annabelle (and subsequently Anna Reese) every night for several months. So happy for her. And, of course, praying for the donor's family as well. I haven't commented in a while, but I do read your blog and pray for Annabell daily. I cried when I read that she received her heart! I can't wait to read about her stroller rides at home-to God be the glory! I will be praying for the donor family as well. However, it is okay to rejoice in your daughter's life. Such good news, Krista. So happy to see she's doing better!! She looks so good! 🙂 Will keep praying!! So glad she is doing well today. I look forward to and pray for the day you can take your sweet girl home. GREAT news!!! And wonderful pics. Oh so happy for little Annabelle and Mama Krista. Praising God through all your storms and through all your rainbows! I can't wait to see you take her on a walk in the neighborhood! God is just so good! I can't believe she is already sitting up, even if it is with help. And she is such a little doll baby with those bows. So sweet! We continue to pray for Annabelle. So glad to hear that she had a better day. Will keep praying that the wires and tubes and wires will quickly disappear and won't need to reappear. She is such a doll! I know Jesus is watching over her not only when you can't be there but when you are there, too. Can't wait to read that she is going home. I am so happy Annabelle is doing much better. She has been in my prayers, as have all of your family. Your blogs are such an inspiration. Your faith in God so real. You are a light to many. Thank you for sharing the blogs with us. 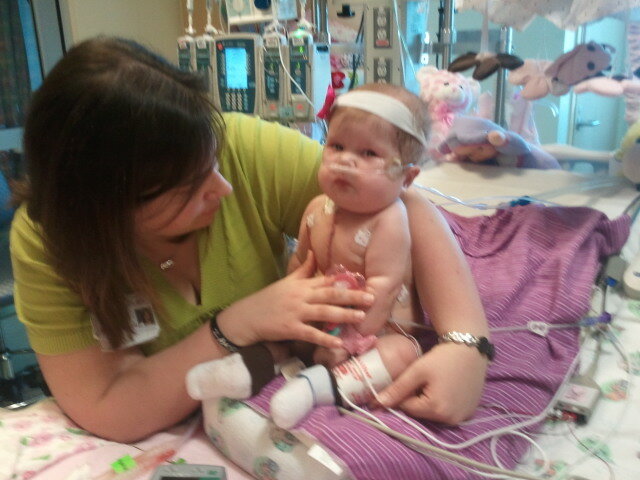 I am Praying Annabelle will recover quickly and be home with you all. Wow. Fantastic progress! 🙂 Go Annabelle! Krista, I have got to say; your faith is amazing. We will be continuting to pray for you all! Wooohooo! I'm so happy to read this!!!! Wow, so good to hear some good news! 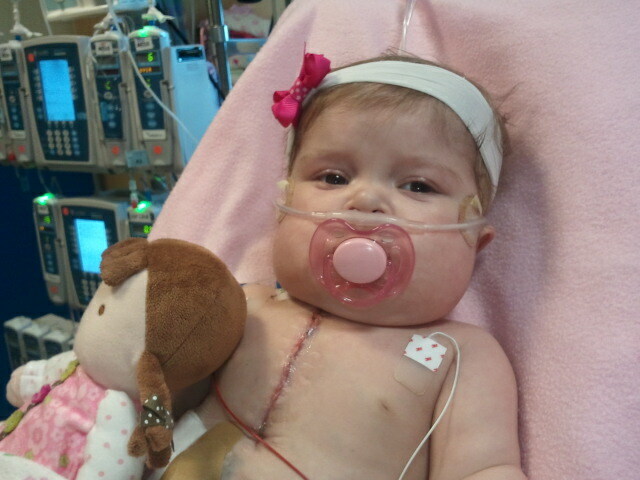 She looks so cute in these pictures, though it's so sad to see her scar and her tubes. Will keep praying that God keeps working miracles and that she is home soon! 🙂 Blessings!